Former PM Ehud Olmert criticizes Netanyahu: I suggest that the leadership talk less. Former Prime Minister Ehud Olmert on Wednesday criticized the conduct of Prime Minister Binyamin Netanyahu. "I would recommend that the leadership talk less and not get excited. 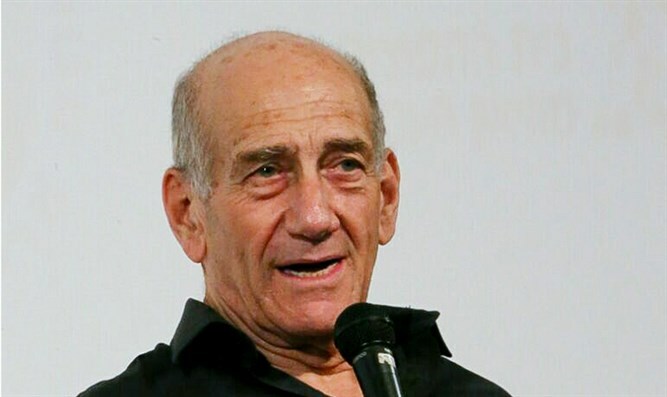 There is a problem here of losing proportion and trying to create things that are not in line with reality," Olmert said in an interview on Channel 10. He added that "when the prime minister says that he is the strong one and that he will do the crushing, as Netanyahu did, then you ask yourself, ‘What else would it take to destroy Hamas if they fired at us 520 missiles [and weren’t destroyed]?’ In this situation Netanyahu was the great and strong hero who decided not to respond. On the other hand, when incendiary kites and balloons are being fired, Netanyahu declares that he will not be silent over this terrible threat." Referring to Netanyahu’s speech earlier this week in which the prime minister urged his partners in the coalition not to topple the government, Olmert claimed that the prime minister falsely used security threats in his remarks. "There is no existential threat to the State of Israel. Nothing happened and was not expected to happen from the time Liberman resigned and until the impression was made that the government is about to be toppled, besides the fact that Netanyahu said baseless things," Olmert said. The former prime minister opined that the rapprochement with Arab states that Netanyahu mentions at every opportunity is not significant if there is no progress in the peace process with the Palestinian Authority at the same time. "None of the Arab states that desire to have open relations with us will do so as long as there is no agreement with the Palestinians. We are missing an opportunity that can change the face of the entire Middle East, and maybe even beyond that," Olmert said. Wednesday’s interview marks the second time over the past week that Olmert has slammed Netanyahu. Last week, Olmert criticized Netanyahu for agreeing to a ceasefire with the Hamas terrorist organization. "If someone else came to such an agreement after 460 rockets, they would call him a traitor. This government said that it will deal with Hamas and instead is giving in to it," Olmert said in an interview with Kan Radio. "The Palestinians taught us a lesson. If the government had a deterrent capability, it is now clear that it does not," he added. The Likud said in response, "Ehud Olmert, who wanted to hand over Jerusalem and was one of the architects of the disengagement and the convergence plan, including handing over most of Judea and Samaria to the Palestinians, will not tell anyone about softness."